Waiting for the dinner hour to arrive. Two of our most regular attendees. The vegetables, sauces and pasta are being prepared. Anna help with food prep. Mark loads one of our two commercial dishwashers. Ruth is a regular on the cleanup crew. The Peterborough Community Supper is a free dinner served every Wednesday evening at 5:30pm. Vegetarian or meat sauce, spaghetti or whole wheat rotini, fresh salad, garlic bread, fruit, dessert, coffee/milk/juice. Since 2003, a free spaghetti supper has been served to an average of 100 people each week (over 52,000 meals!). Originally supported by the Peterborough Unitarian Universalist Church, the supper is completely volunteer-led (by volunteers ranging in age from 10 to 90) and has received small grants from organizations such as NH Charitable Foundation and other area foundations. 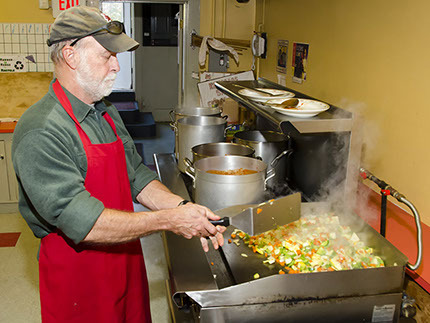 The mission has been to provide dinner in a social setting for a diverse cross-section of Monadnock area residents; to feed residents for whom the cost of food is a challenge; to provide an opportunity for community service and training for ConVal and Conant students where they interact with a diverse population that they might not otherwise know. In addition, the supper has enabled participants to practice their principles: respect for our local community and the environment by buying local foods (organic when possible/affordable), using real china, silverware and glasses rather than disposables, and teaching and mandating recycling. The Peterborough Community Supper serves spaghetti and whole grain rotini, meat sauce and vegetarian sauce, fresh garlic bread, fresh tossed salad, southwest bean salad, coffee, milk, juices and fresh fruit. Desserts are donated each week by people from both the Church and local community. Total annual cost of food and operating expenses is approximately $18,400, or $353 per supper. We have received several grants over the years, which help to cover the costs of food (along with money put into a collection bowl each week at the supper). In 2011 it became difficult to cover the operating expenses of the supper and the local fire marshal warned us that we did not meet fire code requirements. A group of supporters appealed to members and friends to make an individual donations to the supper. The supper currently serves a population from all the towns in the Monadnock Region. Over the years, the number of diners has remained steady, with an average dinner serving at least 100, occasionally reaching as high as 150. In recent years a greater percentage of our diners are people with physical and/or cognitive challenges who come with a caregiver. Several groups come from area communities such as the Lukas Community in Temple, Monadnock Developmental Services in Peterborough, and Crotched Mountain Foundation in Greenfield. Others come from small group homes in the area. We believe that the increase in people with special needs is due to the decrease in the NH state budget for developmental services, which affects group homes. In addition to the increase in diners with special needs, supper organizers note that many more people are asking if they may take home additional meals. The supper organizers now provide “take-out” containers and encourage diners to help themselves to multiple extra portions at the end of the meal. To get a better idea of who attends our suppers, what their needs are, why they come, and more, supper organizers conducted a survey on October 24, 2012. The results of which corroborated what we believed to be true of our regular diners, but indicated that the need is higher than we’d previously estimated. In 2013 the Peterborough Community Supper was in jeopardy of being closed, due to building code violations. An additional fire exit was needed directly from the dining room, and the stove was poorly placed and vented. For the safety of our guests and workers (the whole point of fire codes!) we felt it imperative to accomplish the renovations. At no time did the congregation seriously consider discontinuing. To continue the popular and valued Wednesday night Community Suppers, friends of the supper launched a capital fund drive – appealing to members of the Peterborough Unitarian Universalist Church as well as to the larger community. Over $20,000 was raised and the work was completed, bringing the kitchen and dining room up to today’s safety standards.